Africa is the world's second largest continent after Asia. So huge, you could fit all of the United States, India, China, Western Europe and Argentina inside it. 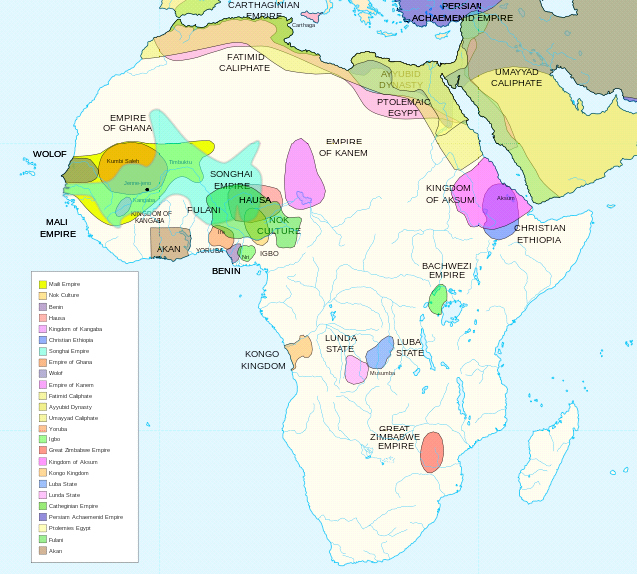 Many African empires and kingdoms existed in the pre-colonial era, such as the Ashanti and Benin, and the Dahomey and Kongo. Nigeria was home to the Haussa, Yoruba and Igbo cultures. Then came the “Scramble for Africa,” a process of invasion, occupation, colonization and annexation by competing European powers between 1881 and the eve of World War One. The result: by 1913, the European colonial powers controlled almost the entire continent. The Berlin Conference of 1885, regulated the European Colonization in Africa, coinciding with Germany's sudden emergence as an imperial power. Compare the way Africa was colonized to the American conquest of the Native Americans. The Europeans treated the Africans with a mixture of utter contempt and appalling cruelty. A joint investigation by the BBC, the Guardian and Democracy Now! American "vulture" investors, have demanded that African nations pay over half a billion dollars for old debts – for which the investors paid only a few million. One New York vulture speculator, Peter Grossman of FG Capital Management, is demanding $100 million from the Democratic Republic of Congo, which is currently ravaged by a diastrous cholera epidemic. Is the colonization of Africa over? http://www.intelligencesquared.com/events/empire The debate "Britain's former colonies should stop blaming the Empire for their ills" took place at Cadogan Hall in London on 17th November 2011. Event info: The British Empire has a mixed legacy. On the plus side we brought railways, the rule of law and the English language, the world's lingua franca, to far-flung places. Laurens van der Post, author and mystic and a renowned 20th century natural philosopher, shares his vision on life in an interview done 4 years prior to his death in 1996. To access the full 42 minute interview go to www.satvchannel.com or email tekweni@iafrica.com. A Tekweni TV Production.